Certainly, that the Maduro's enabling law was presented yesterday officially does not mean that it will be approved and that even if it is approved a predictable Armageddon will follow. The outrage yesterday is that when a regime decides to roll the dice with such a law it means that we are in dire straits, that its ability to run the country is on the skids. Will that change this week? There is a difference between this enabling law and the ones passed before, or even the attempt at constitutional change sought in 2007. These previous attempts were at least supported by the clear preference of the country for Chavez, for whatever misguided love his voters had for him. Also their scope was less ambitious in that Chavez sought to control specifics (or all in 2007 but at least it was through a constitutional reform submitted to popular vote). What we got yesterday was the declared intention of the regime to control all of the economic aspects of the country and, through them, our private lives. Fascism or Communism, your choice, there are both of these elements in the brief proposal submitted yesterday. By submitting such an unconstitutional law, and worse, simply an improper law, the regime has rolled the dice and called for an open, unavoidable, political crisis. The reasons are a dropping popularity, a misfit president with Maduro, a camarilla of desperate people afraid to lose their privileges and go to jail after a regime change. And more that we have discussed in the past. What is more interesting today is to see the possible scenarios. With the pathological secretiveness of the regime coupled with constant disinformation leaks, we cannot foresee any specific one. But we can draw general consequences. The easiest, in a way, scenario to imagine is that the law does not pass. The regime needs 99 votes and it has only 98 "certain". The thing here that could bring an unexpected surprise is that the enabling law can be, and would be used to purge chavismo rank and file as needed. As such we can be sure that more than one chavista representative is secretly wondering what is the worse fate for him/her: to vote against or to vote for. Voting against makes you a pariah, maybe, inside chavismo but gives enough time to resign, pack your stuff and leave the country if needed. Voting for it means that suddenly some day you can be thrown speedily to the wolves when needed, just as it happened last week with Valencia mayor, Parra, and his family. This possibility, not to be discarded, would be a major setback for Maduro, make the division inside chavismo wide open which is all but certain to provoke the departure of Maduro in a matter of months. We do not know what would replace Maduro, from fair elections to open military regime, but such a political defeat coupled to his very questionable legitimacy would make his position unsustainable. The scenario of approval are two, depending on how the law is approved. If the regime cannot find inside the opposition that 99th vote, it may be tempted to pass the law anyway though the help of the high court which is now used to violate the 1999 Constitution as needed. The high court could either remove representatives on any pretext or even "interpret" constitutional requirement. It does not matter, a political crisis would follow. Capriles is already on record saying that if the enabling law is not voted according to the Constitution he will not recognize it. And we can be sure that he will not be alone as one objective of the enabling law is to destroy the current opposition structure. If the chavista regime were to pass illegally the enabling law it would mean that they are also doing a final coup, they will have no other choice. The opposition leadership will be cornered and forced to take a stand. The regime may also find that mysterious 99th vote. It has been at work on that for months now, blackmailing and bribing as many representatives as possible. They may yet succeed though so far it does not seem to be the case. But if indeed suddenly an additional opposition representative were to go to the dark side the "victory" would be an empty one. A political crisis would also follow in this scenario but it will operate in two times. At first, there may be a rather small political crisis inside the opposition since the betrayal may lead a handful more representatives to feel lost in the dictatorship and seek some accommodation. But as the regime starts publishing the laws derived from the enabling law, chavismo will go into purge mode as the conflict between Maduro and Cabello, the radicals and the pragmatists will have to be played out, each side trying to take advantage of the splinter opposition. Or not, it does not matter. Chavismo owes its current façade of unity to the unified opposition which slow but continuous grow scares the heirs of Chavez. The paradox of an Enabling Law victory through dividing the opposition is that this could speed up the break down of chavismo. As the "debate" starts in the Assembly for the dictatorship law we can only be pessimistic. Corruption and the economic crisis will not be solved though that law because the only thing it will do is exacerbate the economic control system, held by the same people who have proven their disregard for economic realities in the last decade and a half. The Venezuelan currency went from 500 to 50,000 for a US dollar, no more comments are needed to prove that point. Unfortunately the other aspect of the enabling law that some people on each side wish for, to postpone a political crisis, will not work either as described above. The enabling law will accelerate the economic and political crises, whether it passes, whether it is applied if it passes. The Enabling Law of Maduro, as justified by chavismo, is not justifiable. 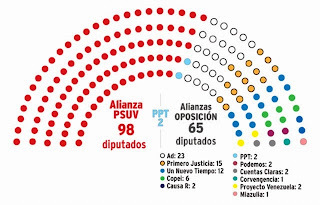 All the laws necessary for the objectives searched are in the books already or could be voted by the comfortable majority that chavismo holds in parliament courtesy of the obscene gerrymandering of 2010 election. The problem for chavismo is that some of the laws needed to either control the economy or make it more manageable, more pragmatical, could not find a consensus inside chavismo if they were to be discussed. By imposing them from above it is supposed to spare chavismo from potential divisions. At the price of democracy of course, but these people never were democrats. Without entering into dramatic major conspiracy theories about chavismo putting up big brother screens in our homes courtesy of the enabling law, we can observe cynically that the enabling laws seeks strict control of opposition political parties finances. Even though chavismo abuses the money of the states for its campaigns, and has severely limited access to opposition candidate sin the media, the disastrous economy keeps strengthening the opposition. The only way left for chavismo to control the opposition, short of putting them into concentration camp, it to make it impossible to find electoral financing. That can only push the opposition, AND dissident chavismo toward violence. Corruption has so corroded chavismo, has created so many groups wanting their share that the only way the regime can find to control and to spread around the money to its true supporters is to make all currency managed directly by a political group inside the presidential palace. The enabling law does offer that possibility. Increased corruption is certain because now all importations would be made in theory through the regime which will sell to the private sector, forbidding them to do their own timely purchases overseas. That the economy will be pushed fast to a standstill is not a problem for the regime, what they want is to centralize all the commissions gained though imports at favorable currency exchanges. The three notes above will have devastating effects fast, something that chavismo in its ideological arrogance is unable to perceive. And thus once the "noble" objectives fail, within 6 months at most, the enabling law will still be running long enough to start emitting the repressive laws that will invade our private lives. Scary stuff for those of us who still live here. The end (change?) is near. Things can't go on like this much longer. "The paradox of an Enabling Law victory through dividing the opposition is that this could speed up the break down of chavismo." Daniel, do you mean to say there could be light at the end of the tunnel? The opposition has been so prostrate lately that any civil could consist of opposite factions of the apes wiping each others out, a win-win situation. Improbable but one can always dream. If they are wholesale attempting to bribe the opposition representatives, then it will be easy to get evidence of that thru entrapment. If so, release that evidence sooner rather than later. 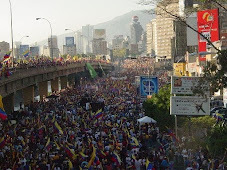 Is this mercopress article about the retired militar wanting to take back venezuela true? Can there be fraud in the vote count in the AN? Is Tibisay Lucena advising on how to get the vote to favor Maduro? Will the Chavistas just move one vote from Against to For and not identify the heretic opposition member because they say that he will threatened with harm? News of shortages of motor oil causing protests from the transport sector. Another story today that Venezuelan airlines can't upgrade their fleets because of lack of dollars. Toyota will close for 2 weeks because of no dollars to buy the necessary parts. Every day there are more stories like these. Its garden variety Stalinism: The Cuban information services will gather any required "evidence;" the new "anti-corruption" laws will terrorize reasonable Chavistas (hopefully, even the military forces) into toeing the party line; under such a threat, the CNE would be crazy not fix the election. No need to incarcerate "free" token opposition leaders. It's interesting that after years of independent media reports describing rampant corruption in the regime, now they have been forced to take this issue up as their own. And of course the new crusade is used immediately to harass and demoralize the Opposition. I don't see how they can possibly get at the root of this corruption without dismantaling the entire power structure that holds the regime together. So it necessarily has to be a fascade to make them look busy and give an excuse to attack their enemies. But I think that even putting the issue out there - like the issue of personal security - is a minor victory that will make people think about what is in play. If crime and corruption are eating into the very sinews of the nation and chavismo has had near total power for 14 years then.... It can't all be a subversive plot. Unless the CIA is really really good. The supposed need for this enabling act only proves that Maduro is in a vulnerable position now, probably even more vulnerable than Chavez was in 2002. People in Venezuela need to start engaging in widespread civil disobedience now. Publicly challenge Chavistas to defend this madness. There are brave people in the barrios of Caracas already doing this, even though they risk death by doing so. Challenge the military and police to uphold the constitution, in spite of whatever Maduro and Cabello want to do. As long as oil can still be exported, nothing else will end the current situation! Think about how long Saddam Hussein lasted in Iraq just because of his ability to move oil out of the country, even under some of the most restrictive international sanctions imaginable. maybe my math is wrong...but don't they need 2 thirds to pass the enabling law? and my math says 2 thirds of 165 seats is 110 votes...why the hubbub over 99 votes? enabling law is 3/5, less than 2/3 but more than a half. This is not necessarily a bad idea since an enabling law is supposed to be limited in scope, addressing a few points of a given "crisis", and the laws to be enacted to be of free revision by the parliament at a later date. Thank you for the article Daniel. I'm surprised that the opposition is not making greater awareness of what is at stake. My guess is that 99% of Venezeulans even know what these laws mean. But the first option you mentioned, about the law not passing, is highly unlikely, I think. I suppose you put it there for the sake of completeness. I just can't imagine them not passing it.